In 1880, Mary Hagen arrived from Switzerland and settled in Bozeman, Montana with her five daughters and two sons. She was Joseph Hagen’s mother, and grandmother to Herman, Karl and Larry Topel. Mary’s daughter Mary Pauline (Lena for short) married Henry Topel in 1882; he had arrived from Germany in 1880. Mary Hagen and Henry Topel founded Bozeman Steam Laundry on the corner of Rouse Street and Mendenhall in 1900. This was the first steam laundry in Montana. Mary Hagen, her children, and one other man comprised the entire staff of the new laundry. Henry continued his career as a tailor, and in 1905 sold his interest in Bozeman’s Steam Laundry to his brother-in-law Michael O’Connell (husband of Mary’s daughter Mary Ada Hagen). This laundry is now called Gallatin Laundry and is currently owned by Mary Hagen’s great-grandson. Gallatin Laundry is the oldest business in Bozeman, and has been continuously owned and operated by the same family. After working with his mother in Bozeman Steam Laundry, Mary Hagen’s oldest son Joseph moved to Missoula in 1908, and opened the Model Laundry in the basement of the Dorothy Apartments. In 1945, Joseph Hagen moved into a new building on 111 East Spruce Street and called the new operation Missoula Laundry. Mary’s other son moved to Seattle, where he and his four sons established a chain of laundries in Washington. 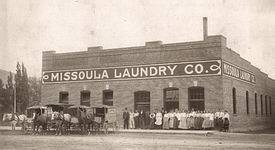 Mary’s daughter Clara married John Sullivan, an employee of Missoula Laundry. John and Clara moved to Yakima, Washington, founding Peerless Laundry and Sullivan’s Cleaners with their three sons. Peerless has been sold but Sullivan’s continues to operate today. Another daughter, Elizabeth, married a Potomac rancher named Mike Flynn, and worked as a seamstress at the Missoula Laundry for many years. Henry Topel’s sons Herman and Karl worked a short time for the Bozeman Steam Laundry. 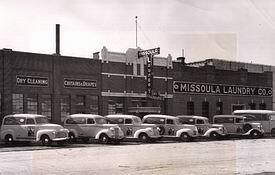 Herman also worked with his uncle, Joseph Hagen, at Missoula Laundry soon after 1915. Herman then purchased Domestic Laundry in Helena, where Karl joined him. In the mid-1920’s Herman and Karl consolidated with Capital Laundry, calling it Capital Domestic Laundry. In 1936 Herman and Karl, together with their youngest brother Larry and financial help from other family members, bought National Laundry in Great Falls. Herman moved to Great Falls to manage National Laundry while Karl remained in Helena to operate Capital. 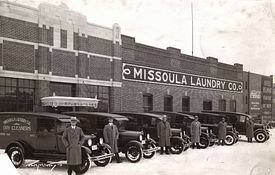 At this time Larry moved to Missoula to learn the laundry and dry cleaning business from his uncle, Joseph Hagen. Larry also attended the National Institute of Dry Cleaning in Silver Springs, Maryland in 1937. 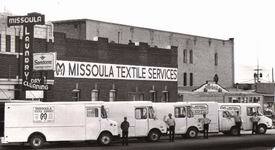 Larry returned to Missoula to complete his training, then on to Capitol in Helena, and eventually to Great Falls where he opened National Laundry’s first dry cleaning operation. Herman, Karl and Larry Topel purchased Missoula Laundry and Dry Cleaners Company from their uncle, Joseph Hagen, in 1947. They sold their interest in Capitol Laundry at Helena. Jim Robinson, a nephew of the Topel brothers, eventually purchased and operated the Capitol until his death in 1964.